Congratulations! You did it! You made the decision to become a Pilates Instructor. You are about to embark on a truly rewarding endeavor which will have a deep impact on your own life and the lives of your future clients. Now, how to choose the best Certification Program? Here are a few points to consider before enrolling in a Teacher Training program. 1. Style of Pilates – There are 2 styles of Pilates; Classical and Contemporary. Before selecting a style, I suggest taking classes at multiple studios and with different instructors to determine which style of Pilates suits you the best! 2. Program Reputability – There are HUNDREDS of Teacher Training programs out there, so it is important that you select a program with a strong reputation and a proven track record of success. – Program Longevity – Most reputable programs have been in existence for more than 10 years. Avoid new, start-up programs since their method of training and participant success rates haven’t been proven & tested yet. – PMA Registration – The program should be recognized by the Pilates Method Alliance (PMA). In 2005, the PMA association developed the only third party certification program for Pilates which launched the only third-party certification exam in the Pilates industry. To find a PMA registered school, Click Here. 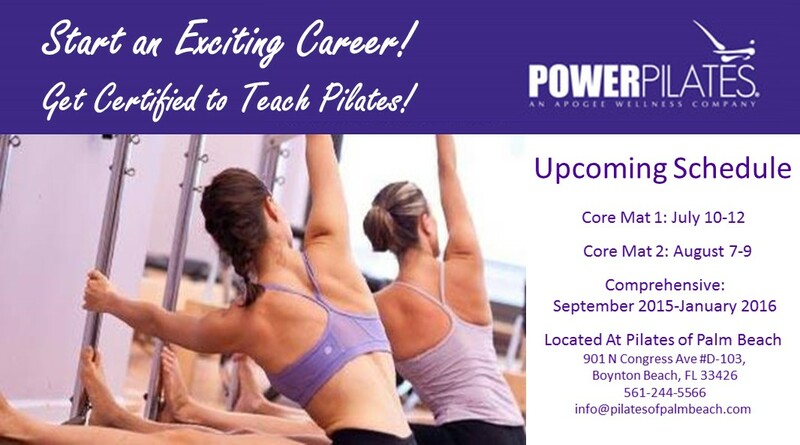 The business of Pilates Certifications is a multi-million dollar industry, so as a way to increase profits, new Teacher Training programs are popping up at studios all the time. Making sure that the program meets the above criteria will ensure that you will receive the best education and avoid costly mistakes. – Acceptance – The program should require an audition or require that you have a strong personal Pilates practice with proof of classes. Most reputable programs will require that you complete a minimum amount of sessions (10-25) with a Teacher Trainer or Senior Instructor. – Progressive Learning – Similar to learning a new language, you need to learn the FOUNDATION of the Pilates method before becoming “fluent.” A solid Teacher Training program will make you start with the basics, typically on the Mat, prior to progressing to Apparatus. – Teaching Formula – Does the program teach you how to teach? Becoming a strong Pilates instructor is MUCH more than learning exercises. You need to be able to effectively communicate with your clients in order to get them to move correctly & safely. The program should have a specific & easy-to-follow recipe for teaching, what we call a Teaching Formula, and this should be the emphasis of the program. – Apprenticeship – The program should require you to complete an extensive apprenticeship (minimum 500 hours) including observation, self-practice, and hands on learning. This gives you time to make mistakes & hone your skills in a safe environment prior to teaching real clients. After you’ve considered all of the above criteria, there is 1 more thing to consider: Compatibility! This is the MOST important criteria! You want to find a program that aligns with your personal goals & principles. Schedule a private session with the program’s Teacher Trainer, and after the session, ask yourself, “How did he/she make me feel?” There’s a lot to be said for the “feel” of a program, and if you don’t get the “warm fuzzies,” the program probably isn’t the best fit for you. Embarking on a Teacher Training program is going to require A LOT of your time & dedication, and you need to ensure that the experience is going to be positive & beneficial. Trust your gut! And enjoy the ride!